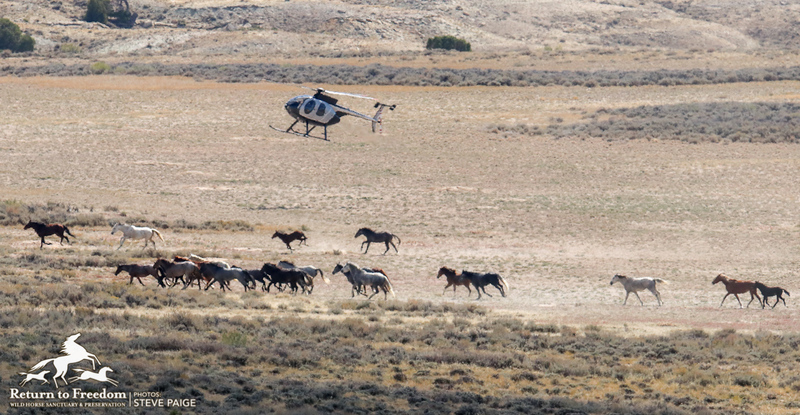 Contractor’s helicopters drive wild horses toward the trap site on Tuesday at the Adobe Herd Management Area. All photos by Steve Paige. The Bureau of Land Management on Tuesday captured 61 wild horses from the Adobe Town Herd Management Area in southwestern Wyoming. That brings the two-day total of adult wild horses captured to 110 as part of the the Salt Wells Creek / Great Divide Basin / Adobe Town heard management areas roundup in southwest Wyoming’s Checkerboard region. A grey mare was euthanized “due to a poorly healed previous fracture to the right hind ankle, was lame with a severly deformed foot. The vet reported that the prognosis was hopeless for recovery,” according to BLM’s daily report. 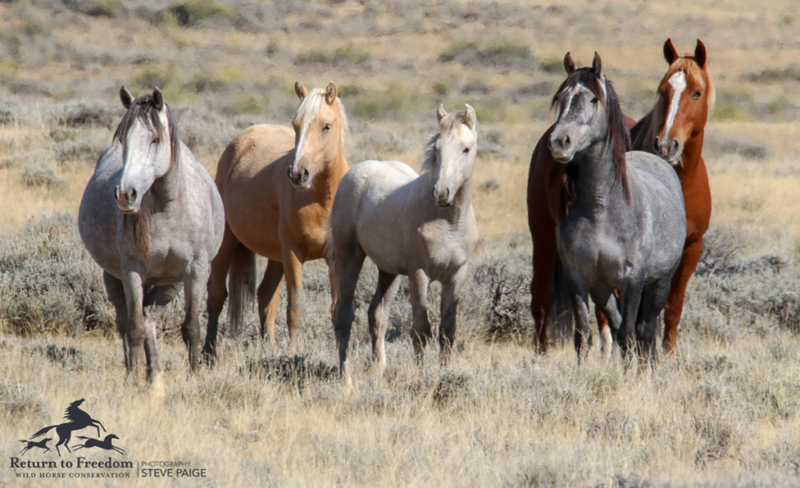 The wild horses captured again put the lie to a narrative driven by critics in Congress that claim wild horses are starving en masse throughout the West. 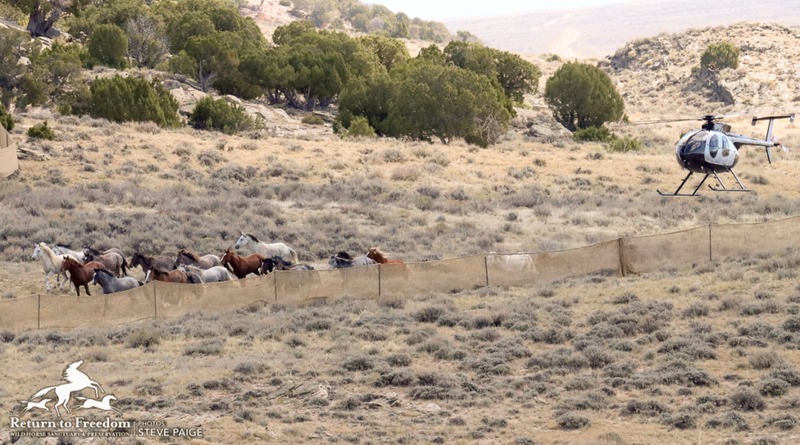 According to RTF humane observer Steve Paige, the captured wild horses all were rated at five (“moderate”) or better on the 10-point scale used by BLM. Other wild horses in the area that escaped Tuesday’s trapping also looked healthy, even a little heavy, headed into winter, during a tour that wild horse photographer Carol Walker gave to three other members of the public who came to observe the roundup (see photos below). 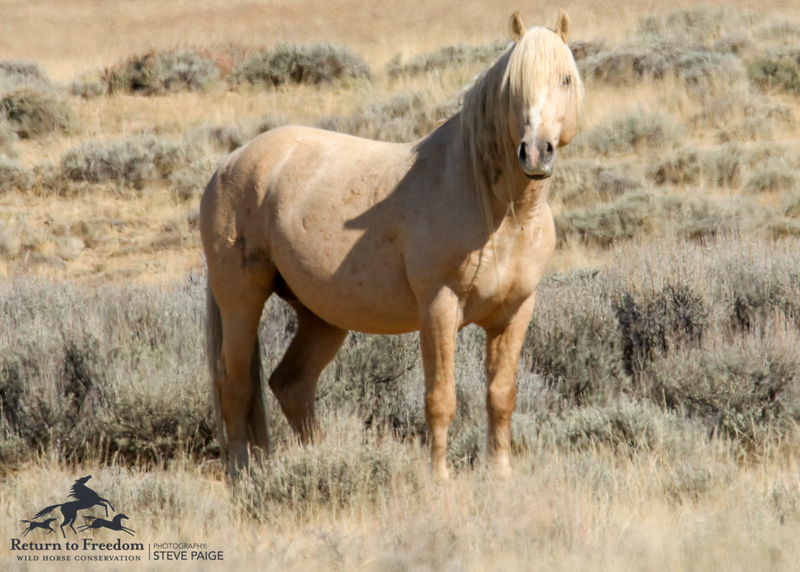 BLM intends to remove 1,560 wild horses from their home ranges on the Salt Wells, Adobe Town and Great Divide Basin Herd Management Areas. 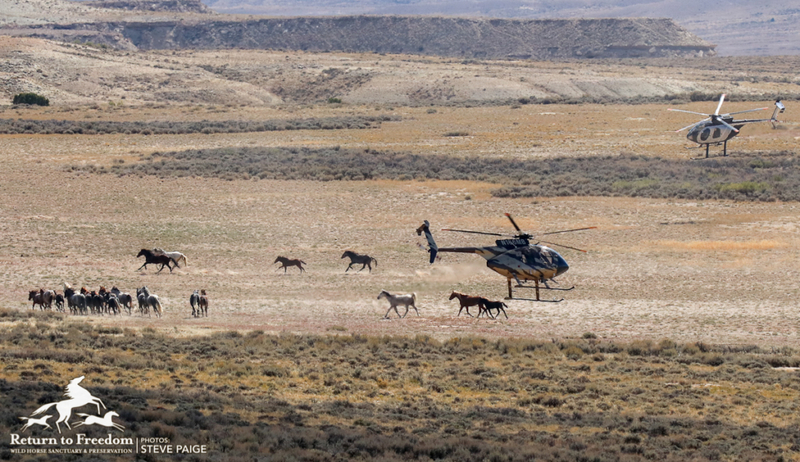 In an unusual step, BLM officials say they’re only counting captured adult wild horses against their goal and will release a number for captured foals later. Twenty-one mares are to be released after being collared as part of a movement study. The other captured wild horses will be transported to the Rock Springs Wild Horse Holding Facility, including 28 that were shipped on Tuesday. They will be offered for adoption. Those that are not adopted will be moved to long-term pastures, according to BLM. Those who wish to view the roundup should contact Tony Brown at (307) 352-0215 or agbrown@blm.gov. They will meet at the BLM Rock Springs Field Office, located at 280 Highway 191 North in Rock Springs, Wyoming. Participants must provide their own transportation, water and food. No bathrooms on-site bathrooms will be available. The BLM recommends driving four-wheel drive, high-clearance vehicles.